There are times when betrayals and heartbreaks play a role in us losing hope in love. Love is a feeling that’s worth waiting for and once you get to experience it, the beauty of it makes all the pain you went through in its quest, feels worth it. If you’re going through a hard time or a phase where you have lost hope in love, you have landed on the right article! Or maybe it was faith? Maybe, you landing on this article is a signal that you shouldn’t lose hope and love will find you soon! To restore this exact hope in love, here is an amazing list of love stories that will make your heart swell and make you question why you felt hopeless in the first place. Celebrities, over the years, have played a huge role in helping us restore hope in humanity, love, and compassion with classics like Notebook & Titanic. One might think that these are old-school and maybe love has changed over the years like so many other things, but you couldn’t be more wrong! Here is a perfect collection of movies, books, and songs that will make you believe in love again! Every person deserves an awesome romantic story that starts them off with the partner of their dreams, but Simon Spear, who’s a year short of 18, has it a bit more complex than usual. In this movie, the people around him have no idea that he’s homosexual and neither do they know who he’s fallen in love with online. Both issues need to be resolved in a truly horrific, ridiculous and hilariously life-changing series of events. Love, Simon is directed by Greg Berlanti (known for Riverdale, Supergirl, and The Flash). It’s written by Elizabeth Berget (This is Us) and Isaac Aptaker, and the plot is based on the novel with the same name, written by Becky Albertalli. It’s a super-funny teenage story encapsulating the journey of finding oneself and experiencing first love. 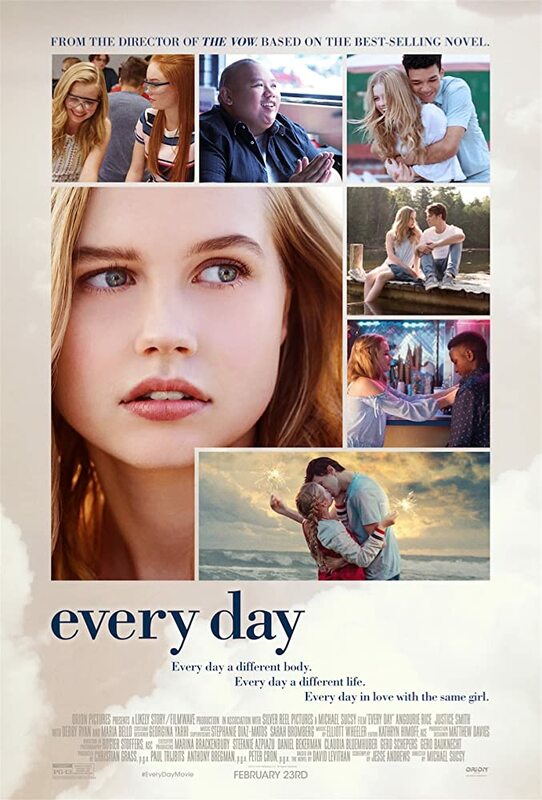 This one’s also based on a novel, a New York Times bestseller named Every Day, written by David Levithan. It uniquely portrays the endeavors of Rhiannon (played by Angourie Rice), who’s a sixteen-year-old girl who’s falling in love with a baffling soul with an uncommon name - “A”, who inhabits a distinct body each day. The two characters feel a clear connection and each of them works every day to get to one another, but they don’t know what every next day has in store for them. It’s a mysteriously confusing story to follow, but it’s unique and engaging, that’s for sure. They find themselves fallen in love for each other, but such an affinity with someone who has a different body every day can’t go on normally forever. Rhiannon has a decision to make, what’s that going to be? Adrift stars Shailene Woodley, the shining actress from The Fault in Our Stars, and Sam Claflin, and it’s based on a remarkable real story of a couple of sailors who move out in their journey across the sea, starting from Tahiti, to reach the destination of San Diego. The two lead characters could have never expected that they’d be intentionally moving directly towards history’s most horrific hurricanes ever. After the storm hits, Tami (Woodley’s character) awakens in its aftermath to find Sharp (Claflin's character) seriously hurt, and their wrecked boat. There’s absolutely zero hope of rescue, but Tami being the only one who’s capable, must muster up the courage and will to save herself and Sharp, who’s the only love of her life. It’s the type of movie that has your mind in another world as you leave the theatre – it's an unforgettable ride, showing the power of human spirit and pure love. 8 years ago, Justin saw Taylor for the first time and instantly fell crazy in love with her, knowing she’s out of his league. He’s tried all that he could to just forget about her, even moved to a different country altogether, but the heart’s desire just can’t be tamed. He has loved her for eight years under wraps, which is a long time to keep the secret inside. Little does he know; Taylor hasn’t forgotten him either – he's been the man of her dreams too. He shows up at her doorstep, transitioning into beautiful bed-in-breakfasts as Taylor longs for a happy ending for the two to end up together. It turns into romantic mornings, wickedly seductive nights in each other’s arms – there's a chance for them! Will everything be shattered by Taylor’s secret though? Nolan Madaris has a great-grandmother who’s a well-known matchmaker that gets it right every time, but even she’s prone to fault. Nolan’s character is a notorious ladies’ man, could be termed as a fun-loving Casanova. He couldn’t ever connect with a person like the straight-laced Ivy Chapman. They can act like they’re an official couple, at least until their families are satisfied – but love was never a part of the plan. Their hearts had other plans though, as Ivy’s tactics to silence her relatives turn into an unexpected bi-product; finding herself in Nolan Madaris’ bed! The womanizer might just have met a girl, the only girl, who could actually satisfy his - mind, soul, and body. The story unfolds as the two have a few key questions to answer before letting one another in. Naledi Smith, one of the lead characters, really does not have even a minute between her stressful jobs and graduate school work. The constantly nudging emails that claim an unfathomable story, that’s she’s “betrothed” to an African prince can only elicit one response – delete! She knows the only couple of factors she can truly depend on is herself, and the scientific method. Fantastical emails are in no way capable to break that reality bubble around Naledi. The male lead, Prince Thabiso is, however, the single heir to The solo's throne. He bears the weight of his parents’ and peoples’ hopes, and most important to them is the Prince’s marriage. Therefore, he sets out to track the betrothed princess-to-be down, which turns into a life-changing series of events for Naledi – the Cinderella of an urban lifestyle. Hip-hop has always been a welcoming place for artists to stand up and clearly discuss their fears and troubles with abusive use of a substance – especially since the recent death of Lil Peep. Travis Scott came forward with his hit “Stargazing” as a clear declaration of love and being sober. It’s a trap song, definitely not for everybody, but for those who can relate will have it in their playlists for a really long time. He says in a line from this song, “I was always high up on the lean, then this girl came here to save ma’ life”, which is a refers to his partner Kylie Jenner – she inspired him to quit substance and they’ve had a kid together not long ago. He deems his rise to stardom to its peak as his bond with Kylie, who’s his guardian angel and also the youngest self-made billionaire in the world. Robyn had been out of the business for longer than the fans could take – eight whole years! There’s this beautiful thing about music though, just play an old song and it’ll transport you back into the era with the memories you had at the time, and Robyn fans had been resorting to this measure for quite a while until she came out with “Missing U” in 2018. Apart from being able to hugely influence her listeners through music, her tracks have been mainstays at nightclubs for years with songs like “Dancing on My Own” - now that one’s still relevant. In “Missing U” she sings about an empty space her lover left behind, which her fans could relate to Robyn’s lack of presence herself for the last 8 years. Reading the introductions to each of these must have done half the job for you. I’m sure you must be having a hard time choosing which one to go for first but I can assure you, close your eyes and select randomly and you will not be disappointed.